Wow! We have almost made it to December. This mild fall has resulted in an extended growing season for Jefferson County farmers. With only three markets left, our farmers are still bringing an abundance of greens, squash, root vegetables, herbs, meat and more to market. This is your chance to stock up on beets, carrots, winter squash, kale, chard, collared greens, broccoli, Brussels sprouts, rutabaga, turnips, celery, apples and pears while they can be purchased directly from our local farmers. EBT shoppers, we still have matching funds available when you use your EBT card at the farmers market booth. For every $5 you spend on your card, we give you an additional $2 for fresh fruit and vegetables. When you spend $20 or more on your EBT card, we also give you one Gimme5 token for produce, meat, eggs and dairy from our local farms. What a deal! Thank you Jefferson Healthcare, Pane d'Amore Bakery, PT Food Co-op, United Good Neighbors, First Federal Community Foundation, FINI and community for your generous support that allows us to increase the accessibility of local food for everyone in our community, regardless of income. This time of year I am asked each Saturday about our last market date for the season. 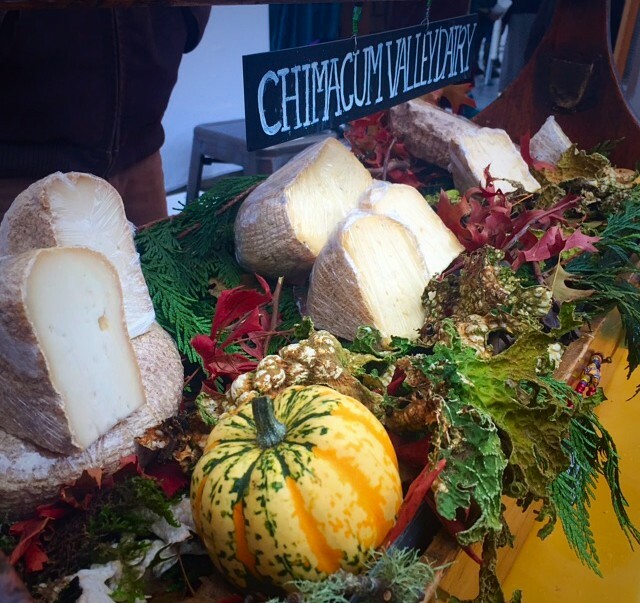 Our Port Townsend Saturday Farmers Market runs through December 17th. The last two markets, December 10th and 17th, will be inside of the Port Townsend Community Center. 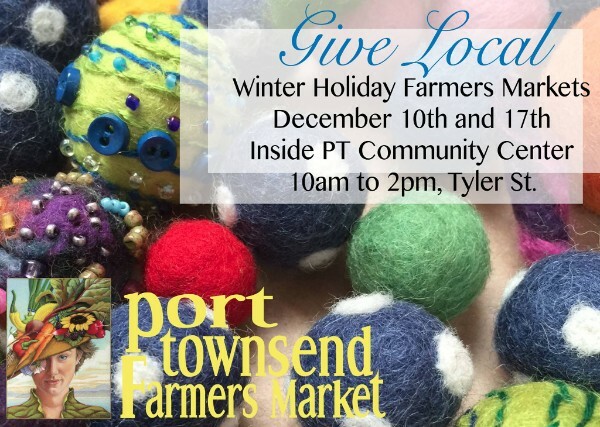 In addition to an abundance of local produce, meat, dairy, and artisan foods, these Holiday Markets will feature original, hand-crafted arts from the Port Townsend Saturday vendors you know and love as well as a few visiting vendors from our Chimacum Farmers Market. We will also have live music by the Wild Blackberry Pickers on December 10th and by Douglas Francisco on December 17th in the Community Center. Kim Thompson, originally from Southern California, first learned to work with wool 10 years ago when riding her bike around New Zealand. A painter by training and profession, Kim found herself at a turning point in her career. After years of exposure to the harsh chemicals in oil paint, Kim developed an allergy to oil as well as other less toxic paints. This extreme sensitivity resulted in a sea change for Kim from professional artist with work in galleries around Southern California and Austin, TX to fiddler and bike traveler. In 2001, Kim moved from Santa Fe, CA where she worked as a professional artist, to Olympia, WA with her fiddle. Fiddle Tunes first brought Kim to Port Townsend. Inspired by the music scene and local community, Kim moved to Port Townsend where she built a small home in the woods. However, the cold and damp of winter motivated Kim to travel to New Zealand, where she had some friends. In New Zealand Kim travelled by bike and played her fiddle on street corners to cover her expenses. 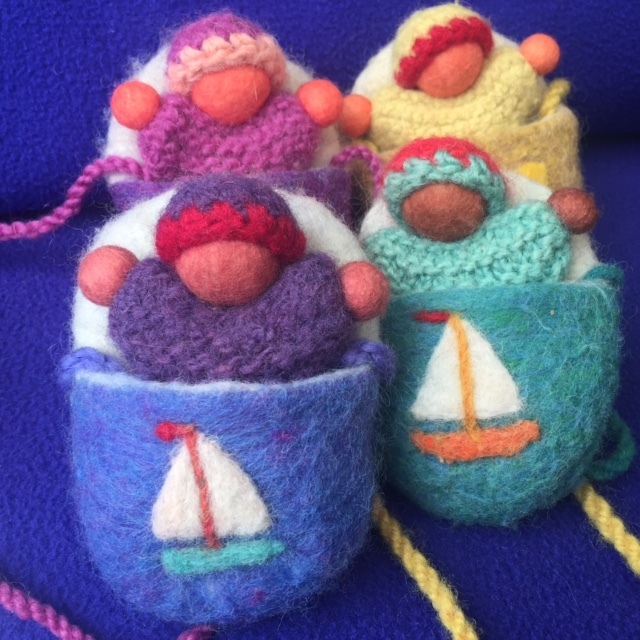 She was introduced to felting and doll making with wool by one of her New Zealand friends. Working with wool was like a homecoming for Kim as it gave her the ability to use her artistic skills without the exposure to chemicals. In 2006, Kim came back to Port Townsend, bought herself a card table and set up at the Port Townsend Farmers Market selling felted dolls. Soon she taught herself to make other felted items: vessels, hats, masks and more. She uses wool from Solstice Farm in Chimacum as well as Ananda Hills Farm in Port Ludlow. Taught by a farmer in Centralia, Kim spins and cards her own wool. 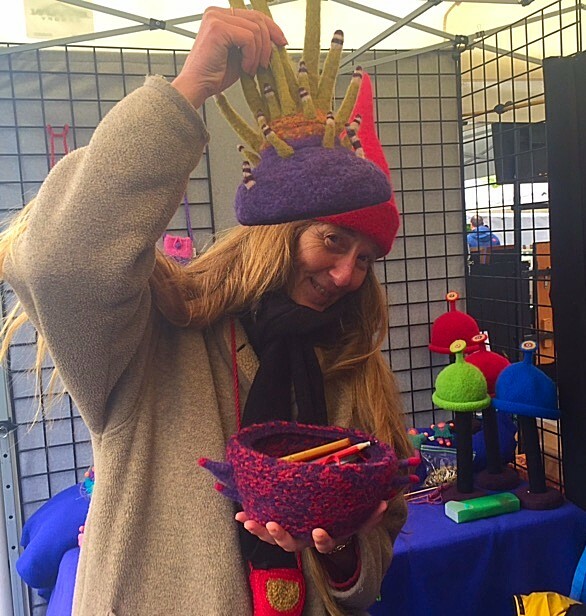 You can find beautiful hats, dolls, animals, vessels and other wool work by Kim on Saturdays at the Port Townsend Farmers Market. She is located in the middle row of the market near the corner of Tyler and Lawrence streets facing the Port Townsend Community Center. This weekend, introduce yourself to Kim and check out her hats. They are perfect gifts for yourself or a loved one this time of year. Lacinato KALE is Nash's veggie of the week!! This kale is one of the most popular varieties we grow and it’s easy to tell why. It can be added to soups, stews, chopped into salads. Truly, the options are almost endless. You can use it to make kale chips. Add it to caramelized onion and bacon for a less healthy and very delicious side dish. The Lacinato kale is also often referred to as “Dinosaur” kale or Tuscan kale and has been used since the 18th century by the Italians. Enjoy! We’ve got SUNCHOKES. Come pick some up this week if you haven’t already! They are a delicious snack and can be roasted or steamed. They kind of look like white ginger root, but taste a little like artichoke and potato. I chopped them up into bite size pieces and roasted them the other night with a little olive oil at 425 F for about 25 minutes. So yummy! We also have carrots, rutabaga, parsnips, beets, leeks, Brussels sprouts, flour, grain and more. Mountain Spirit will have all teas available at 10% off for the remainder of the season. This is a good time to pick up you winter supplies. We have a lot of fun, healthy products for the holiday season. I hope to see you at market, and dress warm. Also, come check out our Hydrotherapy sprays. Red Dog Farm is still going strong with 47 different varieties of veggies. We have tender and sweet frost-kissed kales and squash, crisp and sweet carrots, peppery storage radishes, and buttery popcorn. We’ll be in fine form at market this weekend. Hope to see you there! SpringRain Farm is back at the market this week and will have fresh organic chicken. We are nearing the end of fresh chicken as the season winds down. We also have a limited number of organic pasture-raised turkeys and turkey parts available for Christmas. Check with Roxanne about availability. Randy at the Spot is offering a Year End sale on frozen crab cakes - 1 dozen for $40.00 (includes container of tri-citrus aioli).